Sixteen-year-old Decca Tenderstone feels captivated when she meets Leo, who is arrogant, silent, beautiful, and shoots almost every one he meets. They live in a dystopian future in Los Angeles where every sixteen-year-old is ranked on a scale from one to ten to determine their future. Outranks, who are considered a danger to society, are forced to attend the Monster Show, a brutal sacrificing ritual that is broadcasted worldwide on live TV, where rebellious teens are labelled Bad Kidz or Monsters and get to fight for their lives in deadly games. To prove that you're still alive you have to scream I Am Alive every six hours. Lower your voice, and you're dead. Decca doesn't need Leo's company. She has secrets of her own. While they both can't stand each other, she will find out why she doesn't fit into any rank. Nothing will stand in her way as she has to make choices concerning love, life, staying alive, growing up, and finding out who she really is. This book isn't exactly short, but it was a quick read for me. I finished it in one sitting, and the reason is simple, really - I found myself engrossed in the story early on. (I almost didn't want to give this book a shot because of the very unflattering cover, but I'm glad I did. Never judge a book by its cover, right? And besides, I think there' a newer - and infinitely much better - cover floating around!) The general plot, the characters, and the storylines were intriguing, to say the least, and my interest was also highly piqued by the dystopian world that served as a backdrop to this novel. And to be fair, the first chapter really surprised me too! (I was warned that I ought to prepare for a shock, but I honestly didn't expect what happened! I'm sure that a lot of people will compare this novel to either Battle Royale or The Hunger Games trilogy, but as the author himself points out, the entire 'trying to escape death while the whole world watches' is a concept we see in literature time and time again. (And didn't Roman prisoners fight to their death for the amusement of the general public ages ago?) Moreover, to tell the truth, other than the original premise, I see no similarity between The Hunger Games and I Am Alive. This is just a little something to take note of, because I'm sure there would be readers who would be immediately jumping to conclusions on how this particular novel is a copycat or the like. Decca, the main character, is not difficult to like. While I wish we could have explored her thoughts and feelings more, I still reckon that I understood her character enough. I fully understood why she chose to make some decisions that seem rash and and a bit reckless; and I couldn't blame her for leaving no stone unturned in her quest for answers. I admired her loyalty to her family; her friendship - which was definitely out of a place in her wold - with someone ranked higher than her; and I admire her sheer tenacity and her strong will. Decca is an excellent character to read about. While I did find this novel an easy read, the pacing was a bit off at times for me. It was as if things were moving too fast, and events that should have been explored further were largely ignored. 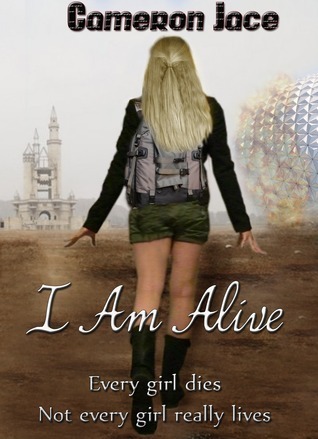 Generally, I like novels that are paced quickly, but sometimes reading I Am Alive gave me something like a whiplash. The quick pacing skipped out on some essential character development (with regards to Leo, the guy Decca suddenly finds at her side, most especially), and I feel like the novel could have been much better if the pacing was toned down a bit. Also, the love story angle felt like a bit of a stretch to me. For me, I don't think the romance brought anything to the story. Moreover, I really don't think the relationship - or love, or whatever - between Decca and Leo was even developed properly, and I couldn't help but wish that it could have just been left out of the novel. Hopefully we get to see more character development in the next book in the series. Also, I did have some difficulty understanding some of the reasons why this world came to be in the first place. All in all, while I did have some misgivings with it, I still consider I Am Alive a strong beginning to a series, and I can't wait to find out what happens next! I enjoyed the pop culture references, as well as Decca's sassiness when it comes to mouthing off with Leo. Leo's quite fun to read about when's he's exasperated too! Another book to my TBR pile! The cover is intriguing plus the plot sounds completely new and interesting!